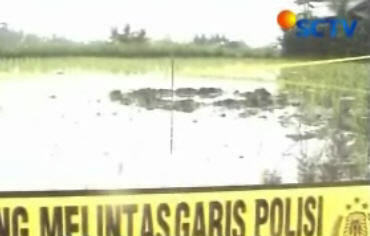 Residents in Sukawati village in Gianyar regency, around 20 kilometers north of Denpasar, reported the appearance of a mysterious crater in the middle of a paddy field Wednesday. The hole was allegedly caused by a falling meteorite fragment. One meter wide and around 30 centimeters deep, the cavity has turned into a large puddle in the heavy rains that have showered the area since New Year's Eve. Disregarding slippery paths leading to the site, hundreds of people came to see the crater with their own eyes, and take photographs of it with cameras and mobile phones. "Residents heard an extremely loud gun-like explosion Tuesday evening around 1 a.m. At the same time, a number of residents saw a bright object falling from the sky," Made Tekek Arimbawa, a neighborhood leader, told reporters. The hole first noticed Tuesday morning by I Wayan Miasa, 60, the owner of the field. Made said he ordered the owner to wait for an explanation from the authorities before using the field again. "We don't know for sure what it is," he said. Sukawati police chief Comr. 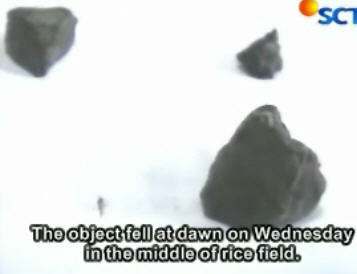 Ida Bagus Bedanajati said pieces of rock were found in the alleged meteorite crater. "The rocks we found resembled pumice but didn't float -- it sank in water," he said. He said the impact had not altered the structure of the soil or killed any plants or animals in the surrounding area. "There were no casualties or material losses. What we do next is wait for the experts," he said. The police had secured the area with a police line. Bali is home to many mystic beliefs where odd and supernatural occurrences like flying fire balls are not unheard of. The Balinese describe the occurrences as niskala which refers to the world of "unseen" phenomena. Bandung Flight and Space Institute sun and space researcher Thomas Djamaludin said Wednesday he believed the unidentified object was a meteoric fragment. He said he suspected a larger fragment had created the hole as it was impossible for small fragments to create the loud noise heard by residents. The fragment would not cause radiation effects dangerous to humans, Djamaludin said. Fragments were "only dangerous at the time of their explosive impact, with a fallout of hot debris ... After that they are harmless," he said in Bandung. See Also: Did meteorite slam Oakland?